Martindale Baptist Church Where knowing Jesus and making Him known is our reason for being here! 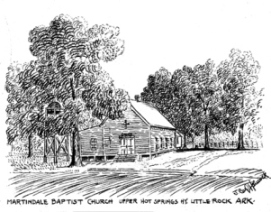 Welcome to Martindale Baptist Church! We are located at 18900 Colonel Glenn Road in Little Rock, AR. We would be honored if you considered joining us as we learn to be more like Jesus everyday. We have Sunday School classes for all ages begining at 9:45 AM. Our Sunday morning worship service begins at 11:00 AM. We gather for the evening worship service at 6:00 PM. On Wednesdays the adults meet at 6:30 PM for Prayer and Bible Study in the Sanctuary. The youth and children have appropriate Bible study classes. A nursery is available for infant through 3 years old on Sunday mornings. Classes for ages 4-5 are available on Sunday mornings. The nursery takes infant-5 on Sunday evenings and Wednesdays. We are Baptist by choice and are affiliated with Pulaski Baptist Association, Arkansas Baptist State Convention, and Southern Baptist Convention. Our doctrine is Biblically founded on The Baptist Faith and Message as adopted June 14, 2000. We believe that Jesus Christ is the Head of our local Church and He administers through our Pastor, Board of Deacons, and others as elected by our local body of Believers. This Church seeks to carry the Savior's missionary and evangelistic message to all men, and believes that there is salvation for lost men in Christ alone. The congregation earnestly seeks to follow all New Testament principles, and desires to follow in all Church life the finest known methods in putting these principles into practice. In our own selves we fail. But in Christ we will succeed. Please consider joining us as we grow to be more like Jesus!